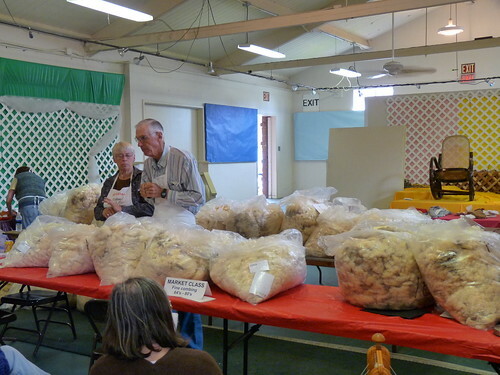 I succumbed to a lot of distractions during the Tour de Fleece... hands down the best was attending the fleece judging prior to the Monterey Wool Show with Heather. She has a great writeup about the day as well. 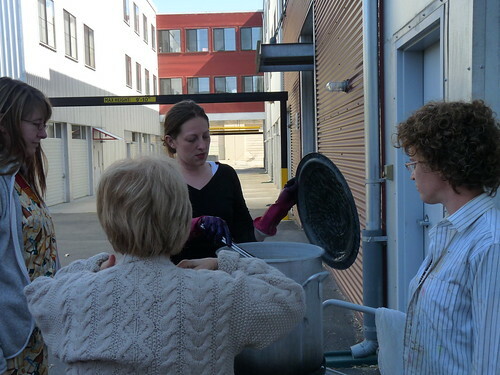 We met in person recently at Verb's Natural Dyeing 101 class, even tho I'd been reading her blog (I feel like I know so many people without ever meeting them in person, so it's always neat to get to do so.) She was kind enough to drive and we trekked it down early Saturday, coming into a room full of fleeces and a small clutch of attendees listening to (married) judges Wes and Jane Patton going over each. This was the second time I had attended a wool judging, the first was at Lambtown last year with about a third to half of the number of fleeces that were at Monterey this year. 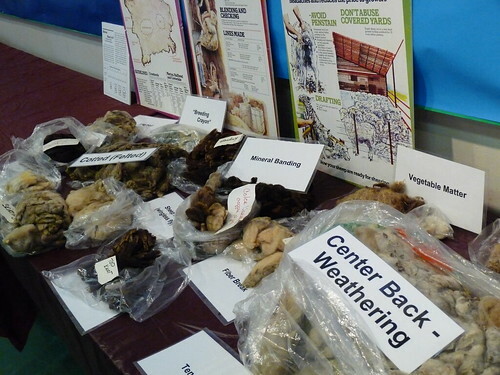 In addition to blood classes (market/white and colored wool, ranging from fine combing/64-80s down to common/40s) Monterey has judging categories for breed as well (cormo, merino, cvm, etc.). For me, I prefer the finer end of the spectrum and am lucky that there were so many excellent cormo, rambouillet and merino cross flocks in Northern California represented for me to lose it over. 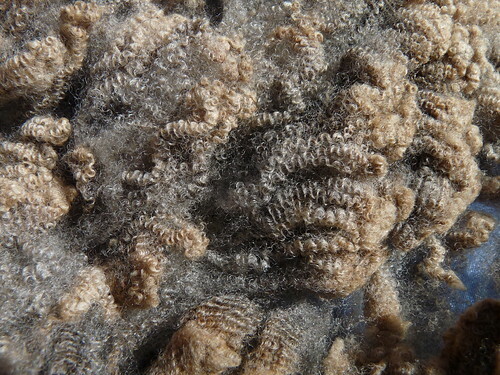 The up side of buying at a wool show that is judged is that these were culled and will not be available for sale-- the buyer knows that each fleece has been gone over and most likely will be sound. It's promising since you don't always know the shepherd or don't know someone who can vouch for them and you're not able to check the soundness of the fleece for yourself. For the seller who sends in a tender fleece though-- I just can't understand the thinking of sending them (unless they don't know they had breaks). There were a lot too-- maybe 8 rejected total? 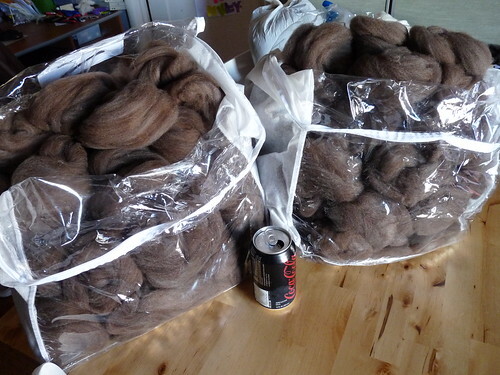 Out of 150+ fleeces that's ~5%, a HUGE number to me! Especially assuming shepherds intentionally sent the best of the best. 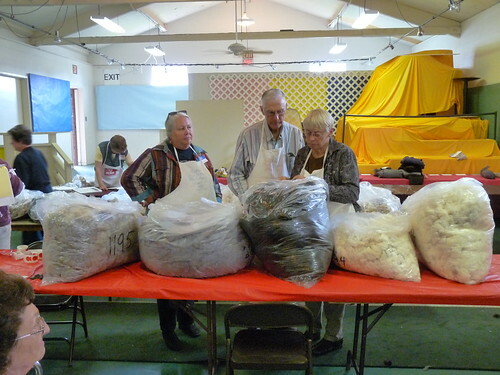 The judging was not the place to see messy, gross, mulch-pile fleeces, but the coordinators were awesome enough to set out several samples of flawed fleeces for the attendees to check out. 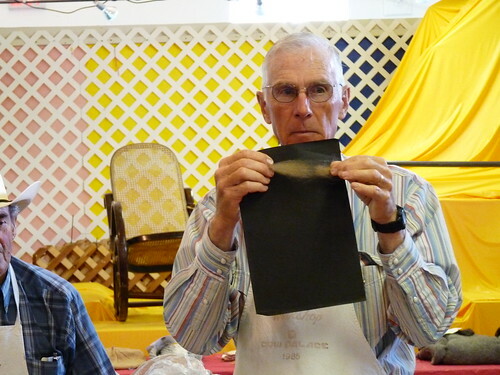 Others were "Notes on Belly Wool," "Notes on Preparing Short Wools," and "Notes on Preparing Sheep for Shearing." 7. 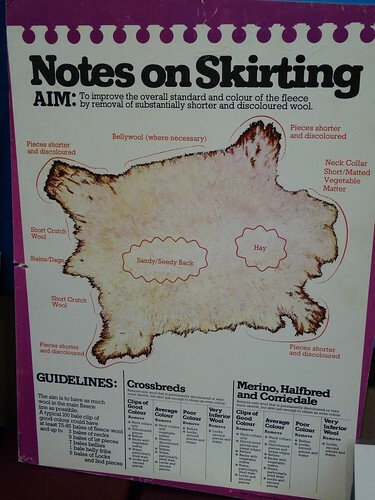 Condition, including staining, VM/2nd cuts, etc. Thinking on it more, it does make sense in Breed-- you could skirt down a 6# fleece to 2# and have the nicest one in the bunch with only shoulder wool. In that instance weight would help keep judging apples to apples, offering the most fleece for judging. For market/colored though-- some breeds are just larger than others and produce a heavier fleece, and would have a leg up in this category even if all were equally skirted just by fleece proportion. I don't really find it bothersome, but just interesting when you think of the higher perceived value of ribbon winners. Any disconnect with the above in judging was more than reconciled with the last judging factor... character. Just off of the bobbins this afternoon with the twist not set, but yay! I finished my Tour de Fleece spinning :) You may recall initially I wanted to comb, spin and KNIT Yvonne in the 22 days... but I am pretty pleased to have apparently spun enough for the pattern (and to spec!) in the timeframe instead. ...I love the diz! 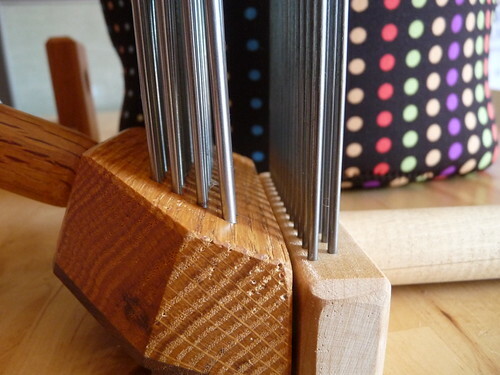 But am happy I can probably move it from my spinning basket and into my spinning/fiber tool case permanently now. Backing up! Since I combed everything at once (oy, I have a LOT of combed sliver left!) I was able to really focus both on the technique and the finished fibers in a way I don't think I have before. 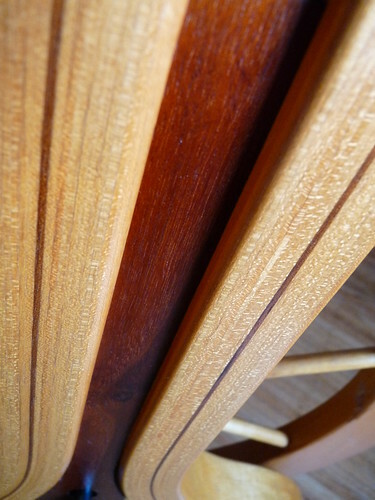 I probably will not continue planking the fibers as I always had before; I didn't for this project because of the time constraint and didn't really see a noticable difference in not doing so. I will plank for some things-- I have a fleece with cotted tips that leave lots of little neps and planking helps me move them about and to catch more of those in the tines, but for regular lovely fleeces? Prolly not. 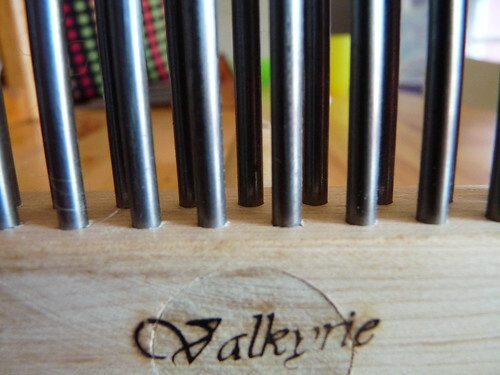 I also had the new combs (Valkyrie minis, did you hear the maker is going to restart produx on them this year?!) to compare to the larger English set... to be honest I don't really have a conclusion as to favorites. 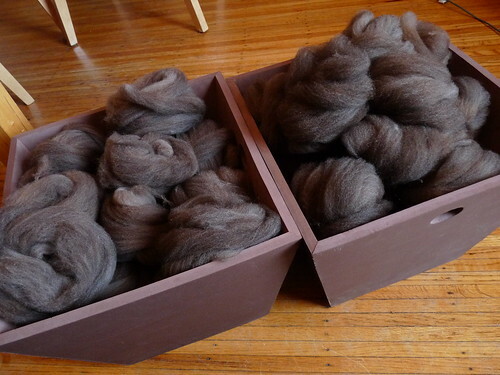 Both produce beautiful fiber and have a place in my heart/toolchest. The minis left marginally more neps in the sliver but also less waste weight, the English produce a heavier sliver but need to be clamped to a table and stood in front of to work. What was interesting was both still worked as combs should work, that is both allow the comber to draw off the longest fibers first and leave the shorter parts behind. I'm a bit compulsive when it comes to measuring staples and getting the same lengths lashed on the comb to begin with (I had jokingly toyed with the idea of tattooing a ruler on my hand but my twitter friends thought it may be a bit... intimidating outside the fiber world ;)) and this fleece was no different. You may remember how my half grey, half white stapled Romeldale lamb pulled off into a striping sliver? The half grey, half brown Corriedale lamb here did something similar. 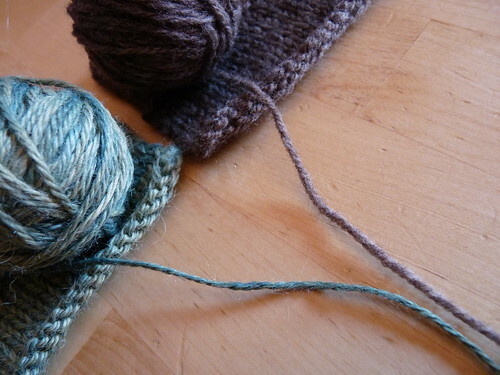 I'm not a purist in combing, I don't mind mixing staple lengths among the sliver and don't strive for a true worsted (that would require all fiber in the sliver to be the same length). I sort it to try and reduce waste-- which is why I didn't just remove the last few inches of sliver on each bit. I also like the idea of random shots of concentrated lighter grey the last few soft inches showing up in the 3-ply yarn... 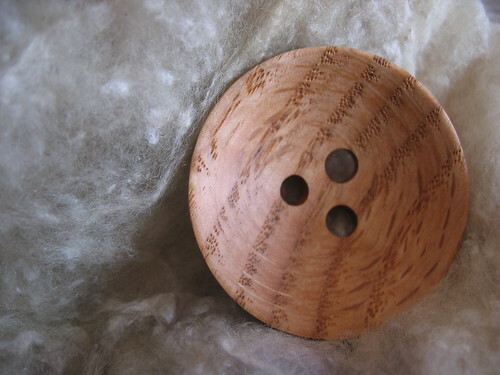 I spun one bobbin from only slivers from the English combs, one bobbin from slivers from the handheld Vikings, and one by alternating slivers... we'll see once I start knitting how those work up, if they stagger like I think they will. A face only a mother could love? Cos really, not something that gets you all hot and bothered. A Verb for Keeping Warm cashmere/silk, "Intergalactic Space Travel"
Or maybe you go both ways. 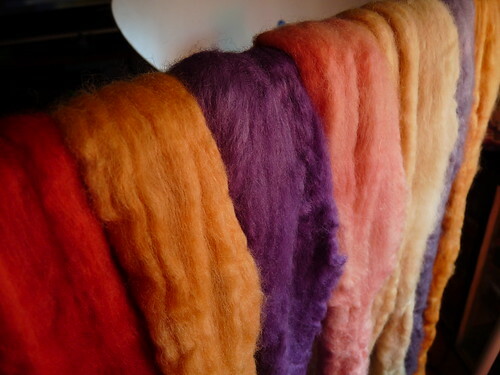 All I know is that I am itching to spin some color once Tour de Fleece is over. 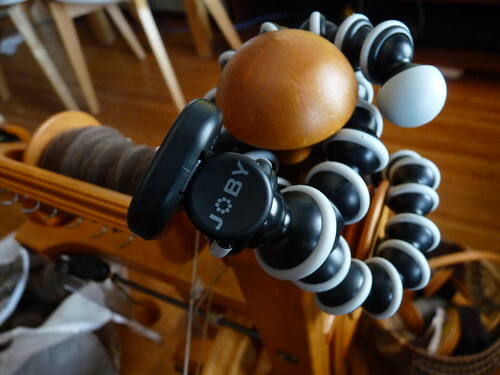 It is slow going for me so far... My short term goal is to fill three bobbins relatively full and ply them into however many skeins I need to to clear the singles, then start spinning again. 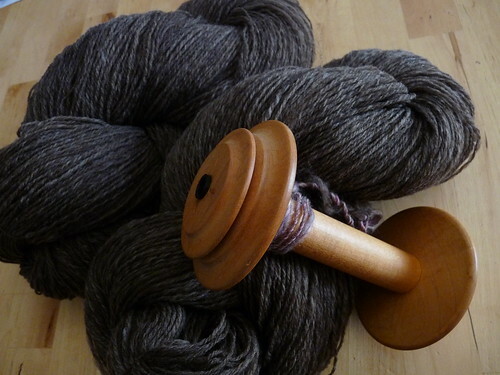 I could spin all of singles at once and just do one straight shot at plying, but I'm reallyREALLY looking forward to plying as a rest in spinning. 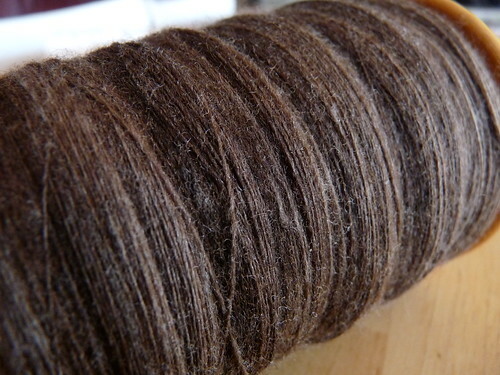 So, it'll be lots of brownish grey singles on bobbins for me over the weekend and beyond. It's a tripod with prehensile legs (doesn't that word just do it for you?!) that can wrap onto slim objects and hold my Panasonic Lumix (and any other camera with a tripod hole) in odd ways as well as traditional tabletop tripod ones. The clearance is also good enough on the Schacht for the flyer to turn and spin while the camera is attached... so of COURSE I had to take a video while spinning some (more) singles. 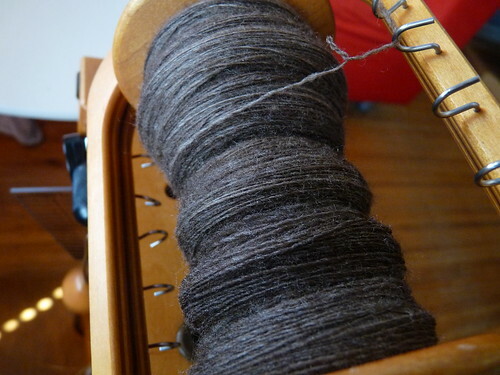 As I've mentioned, I am just in love with cocoknits' new pattern Yvonne and am spinning for it for the Tour de Fleece. The original is knit in Verb's Alpaca/Silk yarn, which I've actually used before (for weaving, the longskinnytextured scarf) and it's a *really* nice yarn. I frankensteined it (it's a 3 -ply), and used the bits and pieces and the original whole as my jumping off point in deciding the kinds of samples I wanted to spin. I decided on the 3-ply, tightly plied (relative to the original) sample with the 32wpi singles. 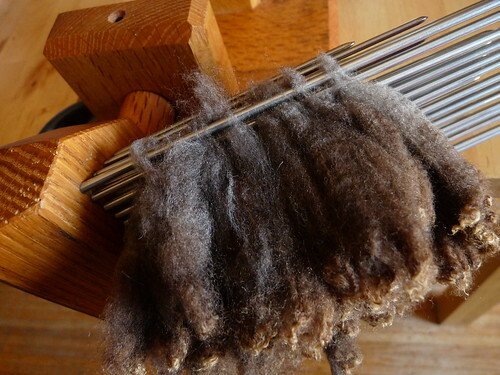 Speaking of my Matchless... two nights ago I finished combing the wool kind of early in the night and I decided to get the wheel ready for spinning the next day. After oiling I pulled out my tub of Wood Beams (handmade oil/wax wood paste by goodies unlimited, smells so good) and gave him a rubdown til he shone. I know there are many lucky souls out there hiphoppity about the 40th anniversary cherry Matchless (and rightly so! ), but sitting crosslegged on the floor in my pyjamas in the middle of the night, turning him over in my hands this way and that, I couldn't help but fall even more head over heels for my big vintage boy and his lovely darkening and flecked maple. Definitely a nice way to start this project. Lots of love, for both of us. Hoping to get some yardage under my belt tonite, the only thing. I used my handheld 2 pitch combs all day yesterday like on day 3, hitting 13% waste yet again. 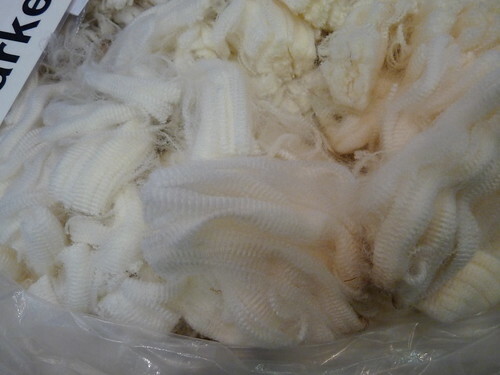 Looking at my numbers above it seems I've averaged ~16% in waste fibers over combing the entire fleece, not bad at all. I went ahead and used one bag for the slivers I dizzed from the English combs and one for the slivers from the Vikings; I'll definitely be looking for differences in spinning them but mainly it's to try and break up any possible color banding/striping as I spin. If I can alternate or spin odd lengths I'm hoping to break any repeating color effect the finished yarn may have-- I'm also going to be spinning a 3-ply which will help as well. 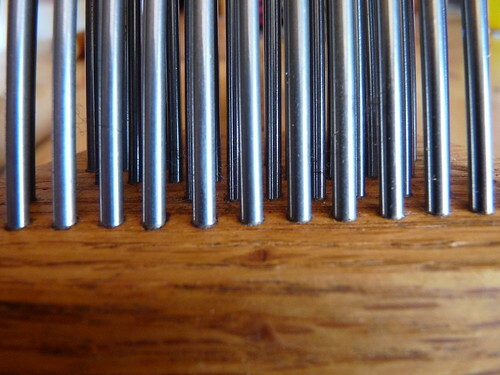 I can't see any differences in the sliver from the different sets of combs by eye. There is definitely a weight difference-- I randomly pulled 6 nests from each bag and weighed them, 22 grams for the 2-pitch and 34 for the 4-pitch. 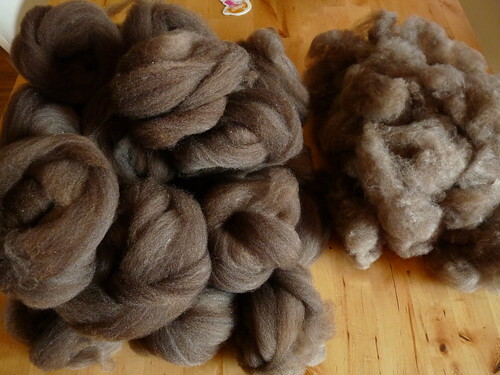 It doesn't sound like a lot until you start thinking about that difference over a whole fleece's worth of fiber (and that you'll expend similar amounts of energy for each combful, assuming each took the same number of passes before a spinnable sliver was formed.) 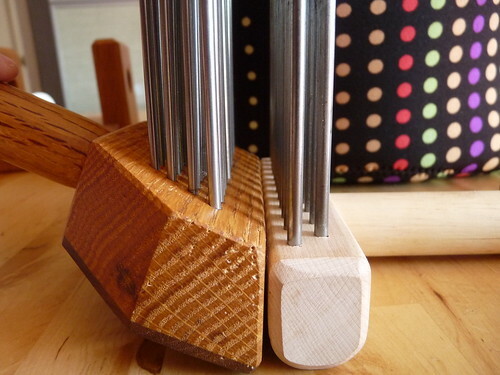 Also keep in mind that the sliver from 2-pitch combs is not going to give you a "true worsted" spinning experience if it's important to you (all lengths in your sliver will not be the same as they will with higher pitch combs), but for me that's not a big deal since I default to Paula Simmons' draft against twist/spinning for softness and speed spinning anyways. I still don't have a preference for either/or, I think they both will have a happy place in my tool stash for a long time coming. I wanted to share comparison pics of the difference in size/tine spacing and circumference, just because I like these forest-thru-the-trees images :) I also am including comparison pics of the Valkyrie Standard combs, also no longer in production. 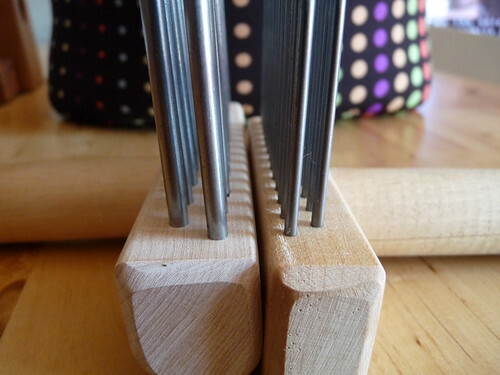 Note that the Valkyrie standard set has the largest diameter tines of all 3-- where the Craftsmith and Valkyrie minis are much closer in terms of tine size. There's also the issue of how those tines are spaced, not only next to one another in the row but how far the subsequent rows are spaced as well. The rule of thumb is going to be the finer the tines and the more they're spaced together, the more appropriate they are for finer fleeces. 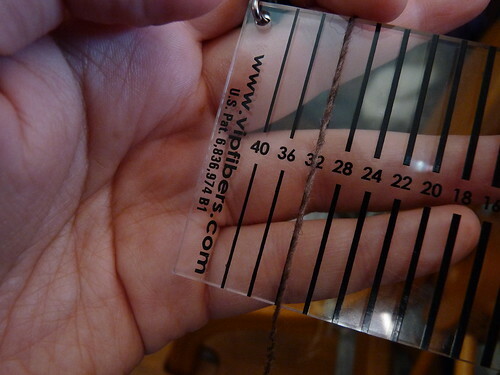 (Think of the more teeth per sq inch in carding cloth/finer fibers rule, same idea.) 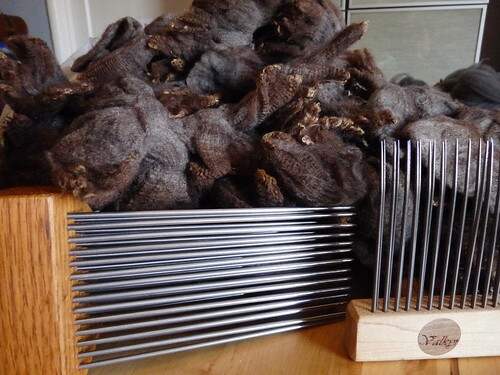 The larger, wider set tines of the Valkyrie standard set (or other "standard" Viking sets) will be optimal for coarser fleeces... or other applications like blending, pre-combing, etc. I'll definitely be trying the standard set on some (more!) new fleeces... but that's enough for tonite :) I need to get spinning! 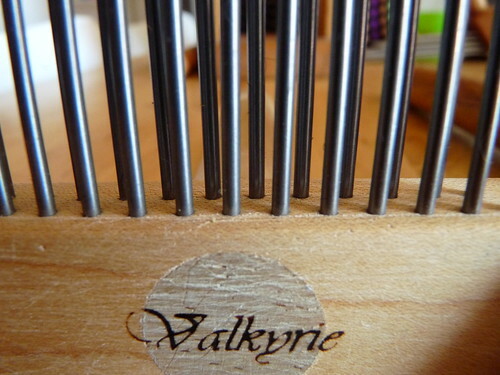 Yesterday I spent my Tour de Fleece time combing fleece (again), but this time on my new-to-me set of Valkyrie handheld 2-pitch Viking combs instead of the Craftsmith 4-pitch fine English set. 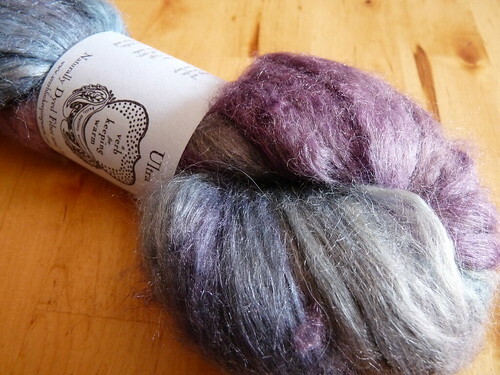 I swapped for the Valkyries on the Ravelry Spin or Dye swapping board (along with a bunch of other stuff I should show you sometime, super awesome forum for spinners, dyers, and raw fleece junkies) for some of my unloved stash and I'm glad I did. Don't get me wrong, I love my big combs! For a while now though, I've wanted to be able to sit and comb. It sounds silly, but the first day of TdF I stopped combing for the day not because of time or upper body fatigue, but because my legs were starting to hurt. I'm not used to standing in one place for a long time at this point in my life, and the time does take a toll when trying to comb for volume and not just the day's spinning. So yesterday was all about the Valkyrie handhelds... their "mini" size. Valkyrie isn't making these anymore but sometimes you can find them used (their tines are not stainless, be sure to ask on their condition if you find a set.) They are great, solid tools. I also swapped for the "pad" that holds the combs so you can pull off the sliver with both hands, or I suppose use it more as a fixed station to swing at like a large set. The appeal for me with these was to be able to use them freehand so I use it to be able to pull sliver off more easily. 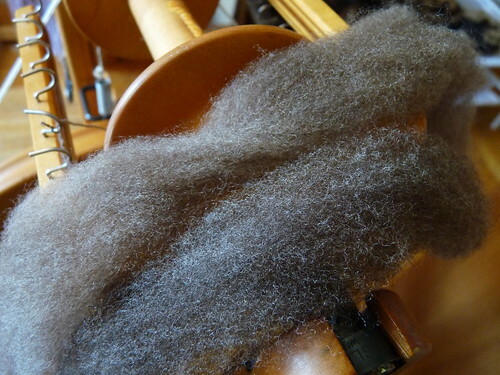 I've been weighing my waste fibers and finished sliver as I've gone along on the TdF challenge, more for curiosity than anything (I didn't plan on using the Valkyries for combing to compare.) It is worth noting though that yesterday I hit 13% waste using the handheld 2-pitch versus the ~20% when using the 4-pitch English. It makes sense, more tines catching more waste. 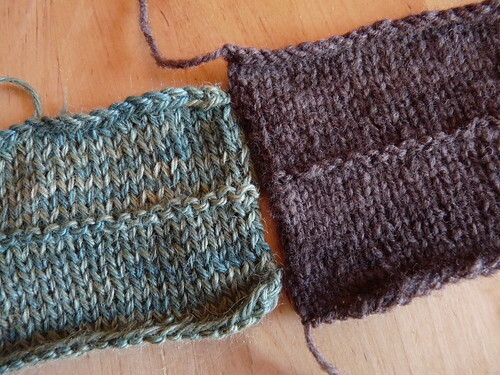 The fleece is also a shorter staple than probably optimal for the English set (3"). 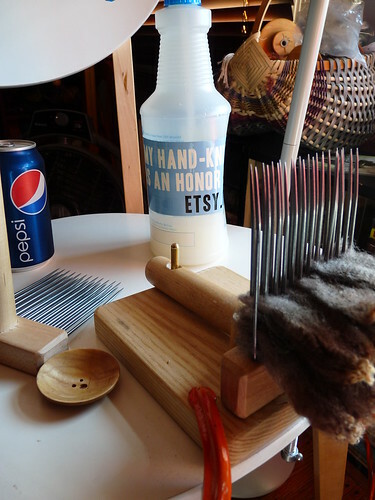 I also was using one less pass on the Viking set than the English (3 vs 4)-- since I use the English as a "fixed comb" (the stationary comb never leaves its pad), I need to pass fiber by a multiple of two (taking off, putting on) before dizzing off. 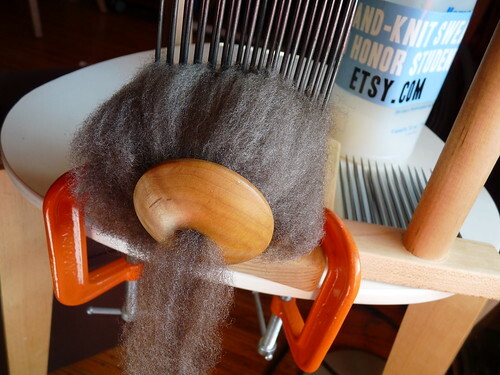 With the Vikings as handhelds, I keep the stationary comb in my left hand and the working comb in my right, transferring fiber from left to right. Once I'm ready, I just switch hands (the full fiber comb goes to the left, the empty/now-working comb to the right) so I can transfer fiber in any number of passes before I decide to diz off. It is nice, being able to comb anywhere I like. Here I'm set up on the couch, watching star wars with the kid and making sliver with the Valkyrie pad attached to a chair. 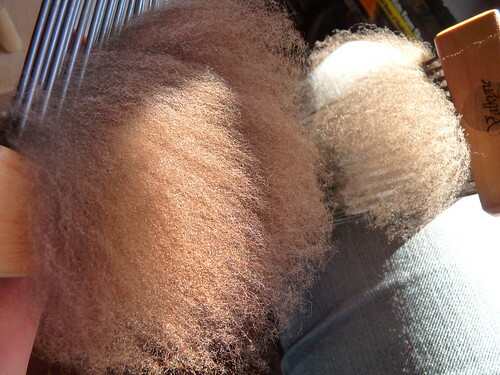 Tonite I'm combing at my desk watching Hulu :) I think I'll be done with TdF combing tonite!! I like both sets, English and Viking. (Really!) I think a truer test as far as waste production goes should be made using a slightly longer stapled fleece-- I think my numbers were higher than normal on the English because of the short staple. (I also did not plank on either set.) There is also the body tradeoff... I found standing for several (several!) hours with the English set to be tiring on my legs, but I never feel tired in arms or upper body since I let gravity do most of the work. With the handhelds I could feel my arms and hands get tired just from repetition and grip, not as much a strength issue. Keep in mind I'm also trying to power thru combing to get to spinning for the Tour; I'm not doing it to the point of exhaustion but it is probably more than I'd usually do any other time. I do get more volume off of the big combs with less effort (fewer passes for weight combed, etc. ), but it becomes a cointoss with everything else considered. Off to finish my tiny pile of locks and oil up the wheel for spinning tomorrow. Yay! 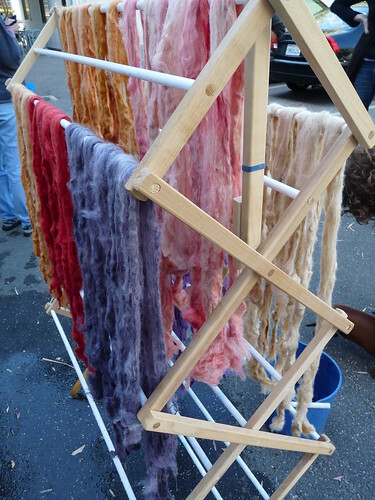 ...and yesterday was washing all of the beautiful BFL we had created. 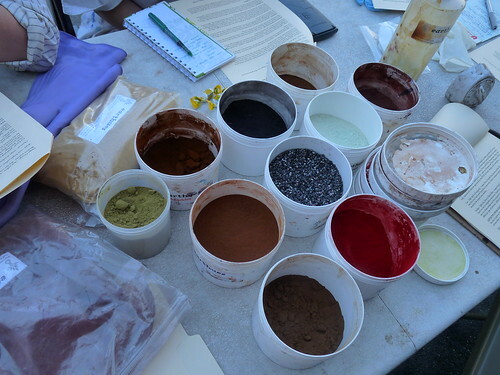 I knew how intense the setup and work involved in natural dyeing was, but didn't body-know it. It really did take us three weeks to get from white wool to color, which is just crazytalk to me when I think about dyeing with acid dyes and being said and done in a matter of days (drying time occupying most of that). I'm glad to have taken the class-- Kristine is an excellent teacher who fielded our questions like no book ever could. I know she'll offer the class again in the fall (after the cakewalks of vending at sock summit and soar :))... and it'll be a prereq to further classes such as cochineal, natural dyegardens, and indigo (lovely indigo discussion on anne's blog here today) that I'm already looking forward to. I joined the Tour de Fleece this year (via Ravelry) because I can't live in my pyjamas behind shuttered windows like the past months anymore. I needed an intense distraction from the choke of my heart and the TdF was a last minute decision to get me moving and burying, or at least on my feet. I'm not going to spin the whole 22 days-- instead I'll comb the latest lovely corriedale lamb fleece from Whitefish Bay Farm, spin it and knit Yvonne from CoCoKnits before the end of the challenge. Ready to go. Or at least move.